Background: Endothelial cells play a major role in highly pathogenic avian influenza (HPAI) virus pathogenesis in gallinaceous poultry species (e.g. chicken, turkey and quail). Upon infection of gallinaceous poultry with HPAI viruses, endothelial cells throughout the body become rapidly infected, leading to systemic dissemination of the virus, disseminated intravascular coagulation, oedema and haemorrhaging. In contrast, the pathogenesis of HPAI viruses in most wild bird species (e.g. duck, goose and gull species) is not associated with endothelial tropism. Indeed, viral antigen is not found in the endothelial cells of most wild bird species following infection with HPAI viruses. This differential endothelial cell tropism in avian species is poorly understood, mainly due to the absence of appropriate cell culture systems. Results: Here, we describe the isolation and purification of primary duck endothelial cells from the aorta or bone marrow of Pekin duck embryos. Cells were differentiated in the presence of vascular endothelial growth factor and, if needed, enriched via fluorescent-activated cell sorting based on the uptake of acetylated low-density lipoprotein. The expression of von Willebrand factor, a key marker of endothelial cells, was confirmed by polymerase chain reaction. Monocultures of duck endothelial cells, either derived from the aorta or the bone marrow, were susceptible to infection with an H5N1 HPAI virus but to a much lesser extent than chicken endothelial cells. 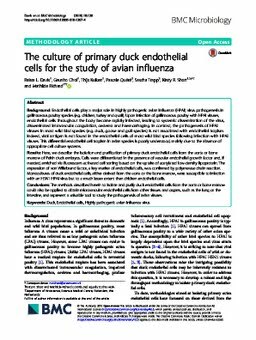 Conclusions: The methods described herein to isolate and purify duck endothelial cells from the aorta or bone marrow could also be applied to obtain microvascular endothelial cells from other tissues and organs, such as the lung or the intestine, and represent a valuable tool to study the pathogenesis of avian viruses.